Renewable energy sources are a growing part of the total energy sector assets. In the first half of 2018 solar and wind projects accounted for 42% of new power capacity in the U.S. Overall, solar and wind have grown to provide 10% of the total U.S. electric power generation. The power industry uses high yield investment vehicles as one funding source for the growth in renewable energy. These stocks can put a solar powered lift in your dividend income. The system roughly works like this. A company constructs a new wind power windmill project or solar array. Once it is near completion the development company will sell the projects future power production on a long term contract with a utility company or other energy user. Once its up and operating, with power contracted to an end user, the new project will be sold to a Yieldco that is affiliated with the developer. The Yieldco gets an asset with a long term revenue stream to support dividend payments. The developer gets paid back for the development and can put the capital to work developing another project. The result is that Yieldco stocks are steady dividend payers with good prospects for dividend growth. 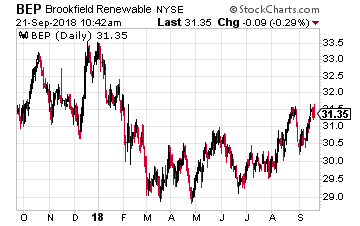 Brookfield Renewable Partners LP (NYSE: BEP) operates one of the world’s largest publicly-traded renewable power platforms. Its portfolio consists of over 17,400 MW of capacity and 876 generating facilities in North America, South America, Europe and Asia. 76% of production is from hydro-electric power facilities. Unlike other renewable income stock companies, BEP does not drive growth through acquisition. Instead it grows internally through contracted rate increases and becoming more financially efficient. The company projects annual dividend growth of 5% to 9%. 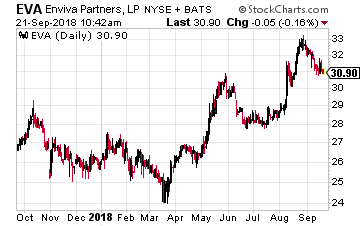 Enviva Partners, LP (NYSE: EVA) is a publicly traded master limited partnership (MLP) that takes a different type of natural resource –wood fiber– and processes it into a transportable form, wood pellets. The pellets are sold on long term contracts to companies in the UK and Europe where they are burned to produce electricity. The company has stated it suffered no major damage, but third quarter production may be affected. Enviva has increased its distribution every quarter over the three years since its IPO. 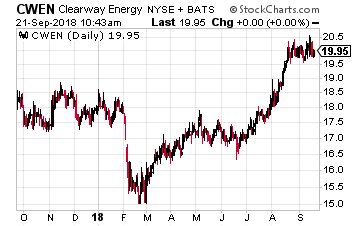 Clearway Energy (NYSE: CWEN) is NRG Yield Inc. (NYSE: NYLD) with a new name and a new sponsor. The Yieldco owns a nationally diverse portfolio of conventional, solar, thermal, wind, and natural gas electricity production assets. The company was spun out in 2012 by NRG Energy (NYSE: NRG), a regulated electric utility company. Renewable energy assets developed by NRG were sold to NYLD to support the growth of NYLD. Recently the controlling sponsor interest in NYLD was acquired by Global Infrastructure Partners. Along with control of NYLD, Global Infrastructure purchased NRG Renewables 6.4 GW project backlog. This means the NYLD double digit per year dividend growth story will continue. Join me, Tim Plaehn, for a live interactive training on using the Disruptive Dividends strategy to boost the returns of your dividend stocks with little effort. I’ll even show you how you can get dividend-like yield from stocks that don’t pay dividends. 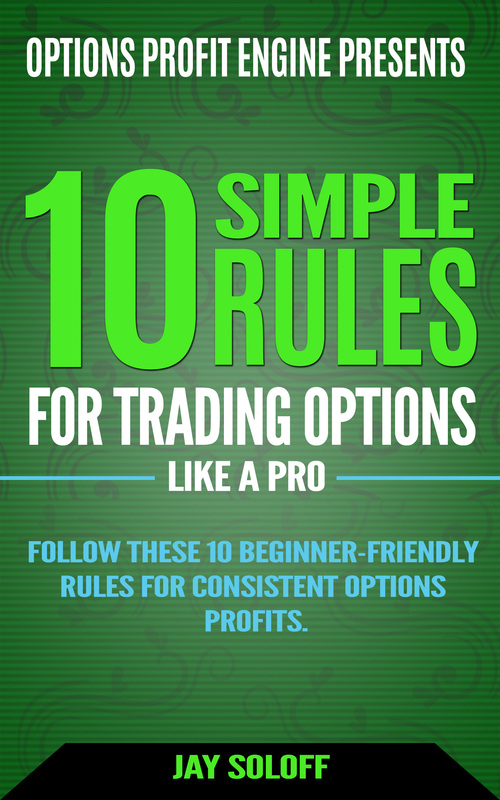 You’ll also get my 4 newest trades that you can place the very next morning. The event is on Wednesday, September 26th and registration is free. Click here for details.